As the Queen sat down in the Royal box to watch a musical extravaganza in her honour, she may have raised an eyebrow at some of the racy outfits on show. The Queen's Diamond Jubilee concert, which was held outside Buckingham Palace, turned into a fashion show as a number of artists took to the stage. 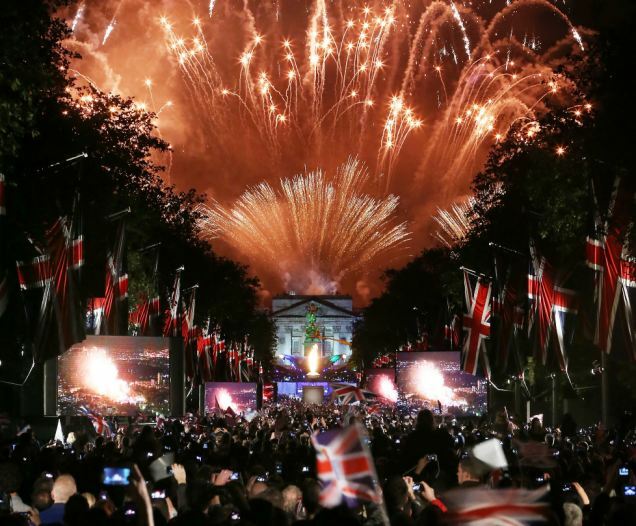 Leading the way was the queen of pop Kylie Minogue, who paid homage to London in her own special way, tonight. The pint-sized singer dressed up as a pearly queen but chose to wear a rather short dress instead of the traditional longer length option. 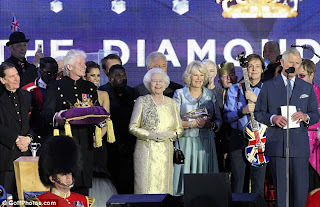 The 44-year-old Australian looked great in the outfit with a black leather jacket which had been lined with large pearl buttons and a matching hat. As she belted out some of her classic songs the heat of the stage lights obviously got too much for her and she removed the heavy coat. Strutting around the stage in her specially made play-suit, the former Neighbours star was full of confidence supported by her special backing dancers. Britain's Got Talent finalists Flawless body-popped and flipped around while she continued her performance. As twitter users became vocal about her costume, one of her followers was particularly pleased with the outfit. Jessie J couldn't compete with the Spinning Around singer but she tried her best to look good in an attention grabbing frock. The Voice mentor gave a memorable performance alongside will.i.am but he stage costume was the centre of attention. She wore a blue and black dress which featured a thigh high split along the left hand side of it and blue feathers. 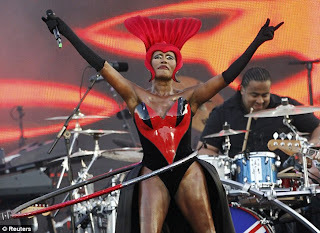 The most risque dress was undoubtedly worn by Jamaican-born singer Grace Jones, who wore a red and black body and a bizarre head dress. The 64-year-old showed off her impressively toned long legs and also began to trend worldwide for singing and hula hooping at the same time. Grace performed Slave to the Rhythm, while the crowd watched on in awe at her flexibility and poise.